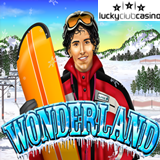 Hit the slopes this week in metro-style Lucky Club Casino’s new Wonderland slot game from Nuworks and you can claim a $150 casino bonus. The new winter sports-themed slot has a great Re-spin Feature to extend playing time and increase wins. It also has a Win-Win feature so you can count on a decent win during bonus spins. Until this Friday, December 7th (only), your Lucky Club Casino deposits up to $150 will be doubled if you enter coupon code WONDER100. The wild symbols in Wonderland’s are Snowboarders – a girl, who doubles any win she appears in, and a guy. Get them on the first and fifth reels and you'll trigger the Winterland Re-spin Feature. During bonus spins, the Snowboarder Wilds are held as the other reels re-spin 3 times. Wonderland has a quite a low betting range -- you can bet just a penny per line or up to $.25 per line. Lucky Club Casino has a wide selection of unique game from Nuworks available at only a few select online casinos.